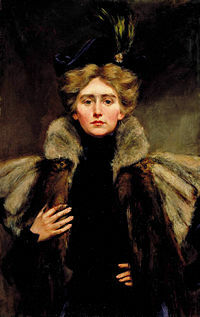 Natalie Clifford Barney, painted in 1896 by her mother Alice Pike Barney. 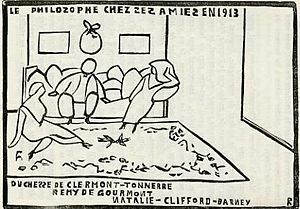 Natalie Clifford Barney (October 31, 1876 – February 2, 1972) was an American expatriate who lived, wrote, and hosted a literary salon in Paris. She was a noted poet, memoirist, and epigrammatist. Barney's salon was held at her home on Paris's Left Bank for more than 60 years and brought together writers and artists from around the world, including many leading figures in French literature along with American and British Modernists of the Lost Generation, expatriates who collected in Paris before and after the First World War. Her indirect influence on literature, through her salon and her many literary friendships, can be seen in the number of writers who have addressed or portrayed her in their works. In her writings, she supported feminism, paganism, and pacifism. Barney was an early advocate of "free love." She opposed monogamy and had many overlapping long and short-term relationships, including an on-and-off romance with poet Renée Vivien, dancer Armen Ohanian, and a 50-year relationship with painter Romaine Brooks. Her life and love affairs served as inspiration for many novels, ranging from the salacious French bestseller Sapphic Idyll to The Well of Loneliness. She was one of the early pioneers of the modernist embrace of a culture of individualism. 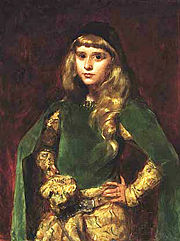 Natalie Barney at about age 13, painted by Alice Pike Barney. Natalie Barney was born in 1876 at Dayton, Ohio, to Albert Clifford Barney and Alice Pike Barney. Her father was son of a wealthy manufacturer of railway cars and of English descent while her mother was French, Dutch, and German. When she was six years old her family spent the summer at New York's Long Beach Hotel where Oscar Wilde happened to be speaking on his American lecture tour. Wilde scooped her up as she ran past him fleeing a group of small boys, held her out of their reach then sat her down on his knee and told her a story. The next day, he joined Barney and her mother on the beach, where their conversation changed the course of Alice's life, inspiring her to seriously pursue art despite her husband's disapproval. She later studied under Carolus-Duran and James McNeill Whistler. Many of her paintings are now in the Smithsonian American Art Museum. Like many girls of her time, Natalie Barney had a haphazard education. Her interest in the French language began with a governess who read Jules Verne stories aloud to her so she would have to learn quickly to understand them. 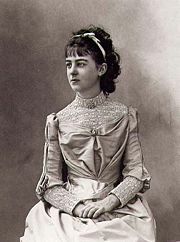 Later she and her younger sister, Laura Clifford Barney, attended Les Ruches, a French boarding school founded by feminist Marie Souvestre and attended by such notables as Eleanor Roosevelt. As an adult she spoke French fluently without an accent and made her home in Paris. Nearly all her published works were written in French. When she was ten her family moved from Ohio to Washington, D.C., spending summers in Bar Harbor, Maine. As the rebellious and unconventional daughter of one of the wealthiest families in town, she was often mentioned in Washington newspapers. In her early twenties she made headlines by galloping through Bar Harbor while driving a second horse on a lead ahead of her and by riding astride instead of sidesaddle. A postcard depicting Liane de Pougy. Barney later said she knew by age 12 she was lesbian and was determined to "live openly, without hiding anything." In 1899, after seeing the courtesan Liane de Pougy at a dance hall in Paris, Barney presented herself at de Pougy's residence in a page costume and announced she was a "page of love" sent by Sappho. 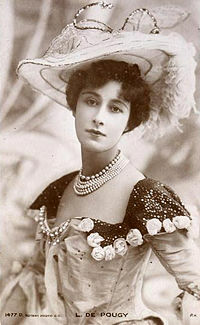 Although de Pougy was one of the most famous women in France, constantly sought after by wealthy and titled men, Barney's audacity charmed her. Their brief affair became the subject of de Pougy's tell-all roman à clef, Idylle Saphique (Sapphic Idyll). Published in 1901, this book became the talk of Paris, reprinted at least 69 times in its first year. Barney was soon well known as the model for one of the characters. By this time however, the two had already broken up after quarreling repeatedly over Barney's desire to "rescue" de Pougy from her life as a courtesan. Barney herself contributed a chapter to Idylle Saphique in which she described reclining at de Pougy's feet in a screened box at the theater watching Sarah Bernhardt play Hamlet. During intermission Barney (as "Flossie") compares Hamlet's plight with that of women: "What is there for women who feel the passion for action when pitiless Destiny hold them in chains? Destiny made us women at a time when the law of men is the only law that is recognized." She also wrote Lettres à une Connue (Letters to a Woman I Have Known), her own epistolary novel about the affair. Although Barney failed to find a publisher for the book and later called it naive and clumsy, it is notable for its discussion of homosexuality, which Barney regarded as natural and compared to albinism. "My queerness," she said, "is not a vice, is not deliberate, and harms no one." In November 1899, Barney met the poet Pauline Tarn, better known by her pen name Renée Vivien. For Vivien it was love at first sight, while Barney became fascinated with Vivien after hearing her recite one of her poems, which she described as "haunted by the desire for death." Their romantic relationship was also a creative exchange that inspired both of them to write. Barney provided a feminist theoretical framework which Vivien explored in her poetry. They adapted the imagery of the Symbolist poets along with the conventions of courtly love to describe love between women, also finding examples of heroic women in history and myth. Sappho was an especially important influence and they studied Greek so as to read the surviving fragments of her poetry in the original. Both wrote plays about her life. Vivien saw Barney as a muse and as Barney put it, "she had found new inspiration through me, almost without knowing me." Barney felt Vivien had cast her as a femme fatale and that she wanted "to lose herself… entirely in suffering" for the sake of her art. Vivien also believed in fidelity, but Barney was unwilling to agree. While Barney was visiting her family in Washington, D.C. in 1901, Vivien stopped answering her letters. Barney tried to get her back for years, at one point persuading a friend, operatic mezzo-soprano Emma Calvé, to sing under Vivien's window so she could throw a poem (wrapped around a bouquet of flowers) up to Vivien on her balcony. Both flowers and poem were intercepted and returned by a governess. In 1904 she wrote Je Me Souviens (I Remember), an intensely personal prose poem about their relationship which was presented as a single handwritten copy to Vivien in an attempt to win her back. They reconciled and travelled together to Lesbos, where they lived happily together for a short time and talked about starting a school of poetry for women like the one which Sappho, according to tradition, had founded on Lesbos some 2,500 years before. However, Vivien soon got a letter from her lover Hélène (the Baroness de Zuylen de Nyevelt) and went to Constantinople thinking she would break up with her in person. Vivien planned to meet Barney in Paris afterward but instead stayed with the Baroness and this time, the breakup was permanent. Vivien's health declined rapidly after this. According to Vivien's friend and neighbor Colette, she ate almost nothing and drank heavily, even rinsing her mouth with perfumed water to hide the smell. Colette's account has led some to call Vivien an anorexic but this diagnosis did not yet exist at the time. Vivien was also addicted to the sedative chloral hydrate. In 1908 she attempted suicide by overdosing on laudanum and died the following year. In a memoir written fifty years later Barney said "She could not be saved. Her life was a long suicide. Everything turned to dust and ashes in her hands." 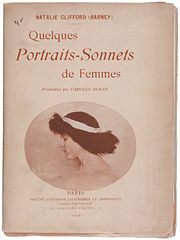 Cover of the 1900 edition of Quelques Portraits-Sonnets de Femmes. In 1900, Barney published her first book, a collection of poems called Quelques Portraits-Sonnets de Femmes (Some Portrait-Sonnets of Women). The poems were written in traditional French verse and a formal, old fashioned style since Barney did not care for free verse. These poems have been described as "apprentice work" but by publishing them, Barney became the first woman poet to openly write about the love of women since Sappho. Her mother contributed pastel illustrations of the poems' subjects, wholly unaware that three of the four women who modeled for her were her daughter's lovers. Reviews were generally positive and glossed over the lesbian theme of the poems. Some even misrepresented it. The Washington Mirror said Barney, "writes odes to men's lips and eyes; not like a novice, either." However, a headline in a society gossip paper cried out "Sappho Sings in Washington" and this alerted her father, who bought and destroyed the publisher's remaining stock and printing plates. Waterlily, a portrait of Barney's cousin Ellen Goin, was one of the illustrations for Quelques Portraits-Sonnets de Femmes. To escape her father's sway Barney published her next book, Cinq Petits Dialogues Grecs (Five Short Greek Dialogues, 1901), under the pseudonym Tryphé. The name came from the works of Pierre Louÿs, who helped to edit and revise the manuscript. Barney also dedicated the book to him. The first of the dialogues is set in ancient Greece and contains a long description of Sappho, who is "more faithful in her inconstancy than others in their fidelity." Another argues for paganism over Christianity. Barney's father's death in 1902 left her with a substantial fortune, freeing her from any need to conceal the authorship of her books; she never used a pseudonym again. Je Me Souviens was published in 1910 after Vivien's death. That same year, Barney published Actes et Entr'actes (Acts and Interludes), a collection of short plays and poems. One of the plays was Equivoque (Ambiguity), a revisionist version on the legend of Sappho's death: Instead of throwing herself off a cliff for the love of Phaon the sailor, she does so out of grief that Phaon is marrying the woman she loves. The play incorporates quotations from Sappho's fragments, with Barney's own footnotes in Greek. Barney did not take her poetry as seriously as Vivien did, saying, "if I had one ambition it was to make my life itself into a poem." Her plays were only performed through amateur productions in her garden. According to Karla Jay, most of them lack coherent plots and "would probably baffle even the most sympathetic audience." After 1910, she mostly wrote the epigrams and memoirs for which she is better known. Her last book of poetry was called, Poems & Poemes: Autres Alliances and came out in 1920, bringing together romantic poetry in both French and English. Barney asked Ezra Pound to edit the poems but then ignored the detailed recommendations he made. For over 60 years Barney hosted a literary salon, a weekly gathering at which people met to socialize and discuss literature, art, music and any other topic of interest. Barney strove to feature women's writing while also hosting some of the most prominent male writers of her time. She brought together expatriate Modernists with members of the French Academy. Joan Schenkar described Barney's salon as "a place where lesbian assignations and appointments with academics could coexist in a kind of cheerful, cross-pollinating, cognitive dissonance." In the 1900s, Barney held early gatherings of the salon at her house in Neuilly. The entertainment included poetry readings and theatricals (in which Colette sometimes performed). Mata Hari performed a dance once, riding into the garden as Lady Godiva on a white horse harnessed with turquoise cloisonné. The two-story pavillon at 20, Rue Jacob. The play Equivoque may have led Barney to leave Neuilly in 1909. According to a contemporary newspaper article her landlord objected to her holding an outdoor performance of a play about Sappho, which he felt "followed nature too closely." She canceled her lease and rented the pavillon at 20, Rue Jacob in Paris' Latin Quarter and her salon was held there until the late 1960s. This was a small two-story house, separated on three sides from the main building on the street. 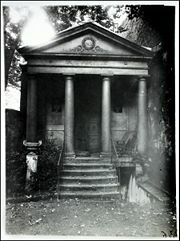 Next to the pavillon was a large, overgrown garden with a Doric "Temple of Friendship" tucked into one corner. In this new location the salon grew a more prim outward face, with poetry readings and conversation, perhaps because Barney had been told the pavillon's floors would not hold up to large dancing parties. Frequent guests during this period included Pierre Louÿs, Paul Claudel, Philippe Berthelot, and translator J. C. Mardrus. During World War I the salon became a haven for those opposed to the war. Henri Barbusse once gave a reading from his anti-war novel Under Fire and Barney hosted a Women's Congress for Peace at the Rue Jacob. Other visitors to the salon during the war included Oscar Milosz, Auguste Rodin and poet Alan Seeger, who came while on leave from the French Foreign Legion (he was killed in combat in 1916). In the early 1920s, Ezra Pound was a close friend of Barney's and often visited. The two schemed together to subsidize Paul Valéry and T.S. Eliot so they could quit their jobs and focus on writing, but Valéry found other patrons and Eliot refused the grant. Pound introduced Barney to avant-garde composer George Antheil and while her own taste in music leaned towards the traditional she hosted premieres of Antheil's Symphony for Five Instruments and First String Quartet at the Rue Jacob. It was also at Barney's salon that Pound met his longtime mistress, the violinist Olga Rudge. In 1927, Barney started an Académie des Femmes (Women's Academy) to honor women writers. This was a response to the influential French Academy which had been founded in the 17th century by Louis XIII and whose 40 "immortals" included no women at the time. Unlike the French Academy, her Women's Academy was not a formal organization, but rather a series of readings held as part of the regular Friday salons. Honorees included Colette, Gertrude Stein, Anna Wickham, Rachilde, Lucie Delarue-Mardrus, Mina Loy, Djuna Barnes, and posthumously, Renée Vivien. Other visitors to the salon during the 20s included French writers André Gide, Anatole France, Max Jacob, Louis Aragon and Jean Cocteau along with English-language writers Ford Madox Ford, W. Somerset Maugham, F. Scott Fitzgerald, Sinclair Lewis, Sherwood Anderson, Thornton Wilder, T. S. Eliot, and William Carlos Williams and moreover, German poet Rainer Maria Rilke, Bengali poet Rabindranath Tagore (the first Nobel laureate from Asia), Romanian aesthetician and diplomat Matila Ghyka, journalist Janet Flanner (who set the New Yorker style), journalist, activist, and publisher Nancy Cunard, publishers Caresse and Harry Crosby, art collector and patron Peggy Guggenheim, Sylvia Beach (the bookstore owner who published James Joyce's Ulysses), painters Tamara de Lempicka and Marie Laurencin, and dancer Isadora Duncan. 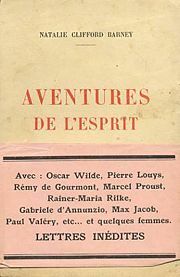 Cover of Aventures de l'Esprit. For her 1929 book Aventures de l'Esprit (Adventures of the Mind) Barney drew a social diagram which crowded the names of over a hundred people who had attended the salon into a rough map of the house, garden and Temple of Friendship. The first half of the book had reminiscences of 13 male writers she had known or met over the years and the second half had a chapter for each member of her Académie des Femmes. This gender-balanced structure was not carried through on the book's packaging, which listed eight of the male writers then added "… and some women." In the late 20s Radclyffe Hall drew a crowd after her novel The Well of Loneliness had lately been banned in the UK. A reading by poet Edna St. Vincent Millay packed the salon in 1932. At another Friday in the 1930s Virgil Thomson sang from Four Saints in Three Acts, an opera based on a libretto by Gertrude Stein. Of the famous Modernist writers who spent time in Paris, Ernest Hemingway never made an appearance at the salon. James Joyce came once or twice but didn't care for it. Marcel Proust never attended a Friday, though he did come to 20, Rue Jacob once to talk with Barney about lesbian culture while doing research for In Search of Lost Time. His visit was put off repeatedly owing to his poor health and when it finally did happen he was too nervous to bring up the subject he had come to talk about. Èparpillements (Scatterings, 1910) was Barney's first collection of pensées–literally, thoughts. This literary form had been associated with salon culture in France since the seventeenth century, when the genre was perfected at the salon of Madame de Sablé. Barney's pensées, like de Sablé's own Maximes, were short, often one-line epigrams or bon mots such as "There are more evil ears than bad mouths" and "To be married is to be neither alone nor together." Remy de Gourmont with Elisabeth de Gramont and Natalie Barney in 1913. Drawing by André Rouveyre. Her literary career got a boost after she sent a copy of Èparpillements to Remy de Gourmont, a French poet, literary critic, and philosopher who had become a recluse after contracting the disfiguring disease lupus vulgaris in his thirties. He was impressed enough to invite her to one of the Sunday gatherings at his home, at which he usually received only a small group of old friends. She was a rejuvenating influence in his life, coaxing him out for evening car rides, dinners at the Rue Jacob, a masked ball, even a short cruise on the Seine. He turned some of their wide-ranging conversations into a series of letters that he published in the Mercure de France, addressing her as l'Amazone, a French word that can mean either horsewoman or Amazon; the letters were later collected in book form. He died in 1915, but the nickname he gave her would stay with her all her life—even her tombstone identifies her as "the Amazon of Remy de Gourmont"—and his Letters to the Amazon left readers wanting to know more about the woman who had inspired them. Barney obliged in 1920 with Pensées d'une Amazone (Thoughts of an Amazon), her most overtly political work. In the first section, "Sexual Adversity, War, and Feminism," she developed feminist and pacifist themes, describing war as an "involuntary and collective suicide ordained by man." In war, she said, men "father death as women mother life, with courage and without choice." The epigrammatic form makes it difficult to determine the details of Barney's views; ideas are presented only to be dropped, and some pensées seem to contradict others. Some critics interpret her as saying that the aggression that leads to war is visible in all male relationships. Karla Jay, however, argues that her philosophy was not that sweeping, and is better summed up by the epigram "Those who love war lack the love of an adequate sport–the art of living." Another section of Pensées d'une Amazone, "Misunderstanding, or Sappho's Lawsuit," gathered historical writings about homosexuality along with her own commentary. She also covered topics such as alcohol, friendship, old age, and literature, writing "Novels are longer than life" and "Romanticism is a childhood ailment; those who had it young are the most robust." A third volume, Nouvelles Pensées de l'Amazone (New Thoughts of the Amazon), appeared in 1939. The One Who is Legion, or A.D.'s After-Life (1930) was Barney's only book written entirely in English, as well as her only novel. Illustrated by Romaine Brooks, it concerns a suicide, known only as C.E., who is brought back to life as a hermaphroditic being and reads the book of her own life. This book-within-a-book, entitled The Love-Lives of A.D., is a collection of hymns, poems and epigrams, much like Barney's own other writings. Barney practiced, and advocated, what would today be called polyamory. As early as 1901, in Cinq Petits Dialogues Grecs, she argued in favor of multiple relationships and against jealousy; in Èparpillements she wrote "One is unfaithful to those one loves in order that their charm does not become mere habit." While she could be jealous herself, she actively encouraged at least some of her lovers to be nonmonogamous as well. Due in part to Jean Chalon's early biography of her, published in English as Portrait of a Seductress, she has become more widely known for her many relationships than for her writing or her salon. She once wrote out a list, divided into three categories: Liaisons, demi-liaisons, and adventures. Colette was a demi-liaison, while the artist and furniture designer Eyre de Lanux, with whom she had an off-and-on affair for several years, was listed as an adventure. Among the liaisons—the relationships that she considered most important—were Olive Custance, Renée Vivien, Elisabeth de Gramont, Romaine Brooks, and Dolly Wilde. Of these, the three longest relationships were with de Gramont, Brooks, and Wilde; from 1927, she was involved with all three of them simultaneously, a situation that ended only with Wilde's death. Her shorter affairs, such as those with Colette and Lucie Delarue-Mardrus, often evolved into lifelong friendships. Elisabeth de Gramont in 1889. Elisabeth de Gramont, the Duchess of Clermont-Tonnerre, was a writer best known for her popular memoirs. A descendant of Henry IV of France, she had grown up among the aristocracy; when she was a child, according to Janet Flanner, "peasants on her farm… begged her not to clean her shoes before entering their houses." She looked back on this lost world of wealth and privilege with little regret, and became known as the "red duchess" for her support of socialism. She was married and had two daughters in 1910, when she met Natalie Barney; her husband is said to have been violent and tyrannical. They eventually separated, and in 1918 she and Barney wrote up a marriage contract stating that "[n]o one union shall be so strong as this union, nor another joining so tender—nor relationship so lasting." De Gramont accepted Barney's nonmonogamy—perhaps reluctantly at first—and went out of her way to be gracious to her other lovers, always including Romaine Brooks when she invited Barney to vacation in the country. The relationship continued until de Gramont's death in 1954. Barney's longest relationship was with the American painter Romaine Brooks, whom she met around 1914. Brooks specialized in portraiture and was noted for her somber palette of gray, black, and white. During the 1920s, she painted portraits of several members of Barney's social circle, including de Gramont and Barney herself. Brooks tolerated Barney's casual affairs well enough to tease her about them, and had a few of her own over the years, but could become jealous when a new love became serious. Usually she simply left town, but at one point she gave Barney an ultimatum to choose between her and Dolly Wilde—relenting once Barney had given in. At the same time, while Brooks was devoted to Barney, she did not want to live with her as a full-time couple; she disliked Paris, disdained Barney's friends, hated the constant socializing on which Barney thrived, and felt that she was fully herself only when alone. To accommodate Brooks's need for solitude they built a summer home consisting of two separate wings joined by a dining room, which they called Villa Trait d'Union, the hyphenated villa. Brooks also spent much of the year in Italy or traveling elsewhere in Europe, away from Barney. They remained devoted to one another for over fifty years. Dolly Wilde was the niece of Oscar Wilde and the last of her family to bear the Wilde name. She was renowned for her epigrammatic wit but, unlike her famous uncle, never managed to apply her gifts to any publishable writing; her letters are her only legacy. She did some work as a translator and was often supported by others, including Natalie Barney, whom she met in 1927. Like Vivien, Wilde seemed bent on self-destruction. She drank heavily, was addicted to heroin, and attempted suicide several times. Barney financed detoxifications, which were never effective; she emerged from one nursing-home stay with a new dependency on the sleeping draught paraldehyde, then available over-the-counter. In 1939 she was diagnosed with breast cancer and refused surgery, seeking alternative treatments. The following year, World War II separated her from Barney; she fled Paris for England while Barney went to Italy with Brooks. She died in 1941, from causes that have never been fully explained, possibly a paraldehyde overdose. Barney's attitudes during World War II have been controversial. In 1937, Una, Lady Troubridge had complained that Barney "talked a lot of half-baked nonsense about the tyranny of fascism." Barney herself was one-eighth Jewish, and since she spent the war in Italy with Romaine Brooks, risked deportation to a concentration camp–a fate she avoided only by wiring her sister Laura for a notarized document attesting to her confirmation. Nevertheless, having no other source of information about the war, she believed Axis propaganda that portrayed the Allies as the aggressors, so that pro-Fascism seemed to her to be a logical consequence of her pacifism. An unpublished memoir she wrote during the war years is pro-Fascist and anti-Semitic, quoting speeches by Hitler apparently with approval. It is possible that the anti-Semitic passages in her memoir were intended to be used as evidence that she was not Jewish; alternatively, she may have been influenced by Ezra Pound's anti-Semitic radio broadcasts. Whatever the case, she did help a Jewish couple escape Italy, providing passage on a ship to the United States. By the end of the war her sympathies had again changed, and she saw the Allies as liberators. Villa Trait d'Union was destroyed by bombing. After the war, Brooks declined to live with Barney in Paris; she remained in Italy, and they visited each other frequently. Their relationship remained monogamous until the mid-1950s, when Barney met her last new love, Janine Lahovary, the wife of a retired Romanian ambassador. Lahovary made a point of winning Romaine Brooks's friendship, Barney reassured Brooks that their relationship still came first, and the triangle appeared to be stable. This painting by Carolus-Duran of Natalie Barney at age ten hung on the wall of her salon at 20, Rue Jacob. The salon resumed in 1949 and continued to attract young writers for whom it was as much a piece of history as a place where literary reputations were made. Truman Capote was an intermittent guest for almost ten years; he described the decor as "totally turn-of-the-century" and remembered that Barney introduced him to the models for several characters in Marcel Proust's In Search of Lost Time. Alice B. Toklas became a regular after Gertrude Stein's death in 1946. Fridays in the 1960s honored Mary McCarthy and Marguerite Yourcenar, who in 1980—eight years after Barney's death—became the first female member of the French Academy. Barney did not return to writing epigrams, but did publish two volumes of memoirs about other writers she had known, Souvenirs Indiscrets (Indiscreet Memories, 1960) and Traits et Portraits (Traits and Portraits, 1963). She also worked to find a publisher for Brooks's memoirs and to place her paintings in galleries. In the late 1960s Brooks became increasingly reclusive and paranoid; she sank into a depression and refused to see the doctors Barney sent. Bitter at Lahovary's presence during their last years, which she had hoped they would spend alone together, she finally broke off contact with Barney. Barney continued to write to her, but received no replies. Brooks died in December 1970, and Barney on 2 February 1972 of heart failure. Barney worked to promote writing by women and formed a "Women's Academy" in response to the all-male French Academy while also giving support and inspiration to male writers from Remy de Gourmont to Truman Capote. She was openly lesbian and began publishing love poems to women under her own name as early as 1900, considering scandal as "the best way of getting rid of nuisances." Her novel, The Well of Loneliness, is arguably the most famous lesbian novel of the twentieth century. By the end of Barney's life her work had been largely forgotten. In 1979, Nathalie Barney was honored with a place setting in Judy Chicago's feminist work of art The Dinner Party. In the 1980s Barney began to be recognized for what Karla Jay calls an "almost uncanny anticipation" of the concerns of later feminist writers. English translations of some of her memoirs, essays, and epigrams appeared in 1992, but most of her plays and poetry are still untranslated. Claudine S'en Va (Claudine and Annie, 1903) by Colette contains a brief appearance by Barney as "Miss Flossie," echoing the nickname she had earlier been given in de Pougy's novel Idylle Saphique. Renée Vivien wrote many poems about her, as well as a Symbolist novel, Une Femme M'Apparut (A Woman Appeared to Me, 1904), in which she is described as having "eyes … as sharp and blue as a blade…. The charm of peril emanated from her and drew me inexorably." Remy de Gourmont addressed her in his Letters to the Amazon, and Truman Capote mentioned her in his last, unfinished novel Answered Prayers. She also appeared in two later novels by writers who never met her: Francesco Rapazzini's Un Soir chez l'Amazone (An Evening with the Amazon, 2004) is a historical novel about Barney's salon, while Anna Livia's Minimax (1991) portrays both her and Renee Vivien as still-living vampires. According to Lillian Faderman, "There was probably no lesbian in the four decades between 1928 and the late 1960s capable of reading English or any of the eleven languages into which the book was translated who was unfamiliar with The Well of Loneliness." Although the novel's author, Radclyffe Hall, intended it as an argument for greater tolerance for what she called "sexual inverts," it has often been criticized by lesbian readers for its protagonist's self-hatred and its use of terms like "freak" and "mistake of nature." Barney, as the salon hostess Valérie Seymour, appears in the novel as the symbol of a different attitude. "Valérie, placid and self-assured, created an atmosphere of courage; everyone felt very normal and brave when they gathered together at Valérie Seymour's." Lucie Delarue-Mardrus wrote love poems to Barney in the early years of the century, and in 1930 depicted her in a novel, L'Ange et les Pervers (The Angel and the Perverts), in which she said she "analyzed and described Natalie at length as well as the life into which she initiated me." The protagonist of the novel is a hermaphrodite named Marion who lives a double life, frequenting literary salons in female dress, then changing from skirt to trousers to attend gay soirées. Barney is Laurette Wells, a salon hostess who spends much of the novel trying to win back an ex-lover loosely based on Renée Vivien. The book's portrayal of her is at times harshly critical, but she is the only person whose company Marion enjoys. He/she tells Wells that she is "perverse… dissolute, self-centered, unfair, stubborn, sometimes miserly… [but] a genuine rebel, ever ready to incite others to rebellion…. [Y]ou are capable of loving someone just as they are, even a thief—in that lies your only fidelity. And so you have my respect." After meeting Barney in the 1930s, the Russian poet Marina Ivanovna Tsvetaeva addressed her in a Letter to the Amazon (1934) in which she expressed her conflicted feelings about love between women. The result, according to Terry Castle, is "an entirely cryptic, paranoid, overwhelming piece of reverie." Barney and the women in her social circle are the subject of Djuna Barnes's Ladies Almanack (1928), a roman à clef written in an archaic, Rabelaisian style, with Barnes's own illustrations in the style of Elizabethan woodcuts. She has the lead role as Dame Evangeline Musset, "who was in her Heart one Grand Red Cross for the Pursuance, the Relief and the Distraction, of such Girls as in their Hinder Parts, and their Fore Parts, and in whatsoever Parts did suffer them most, lament Cruelly." "[A] Pioneer and a Menace" in her youth, Dame Musset has reached "a witty and learned Fifty;" she rescues women in distress, dispenses wisdom, and upon her death is elevated to sainthood. Also appearing pseudonymously are Elisabeth de Gramont, Romaine Brooks, Dolly Wilde, Radclyffe Hall and her partner Una, Lady Troubridge, Janet Flanner and Solita Solano, and Mina Loy. The obscure language, inside jokes, and ambiguity of Ladies Almanack have kept critics arguing about whether it is an affectionate satire or a bitter attack, but Barney herself loved the book and reread it throughout her life. Barnes, Djuna and with an introduction by Susan Sniader Lanser (1992). Ladies Almanack. New York: New York University Press. ISBN 0-8147-1180-4. Barney, Natalie Clifford and trans. John Spalding Gatton (1992). Adventures of the Mind. New York: New York University Press. ISBN 0-8147-1178-2. Barney, Natalie Clifford and ed and trans. Anna Livia (1992). A Perilous Advantage: The Best of Natalie Clifford Barney. Norwich, VT: New Victoria Publishers Inc.. ISBN 0-934678-38-3. Benstock, Shari (1986). Women of the Left Bank: Paris, 1900–1940. Texas: University of Texas Press. ISBN 0-292-79040-6. Bonnevier, Katarina (2007). Behind Straight Curtains: towards a queer feminist theory of architecture. Stockholm: Axl Books. ISBN 978-91-975901-6-7. Castle, Terry (2003). The Literature of Lesbianism. New York: Columbia University Press. ISBN 0-231-12510-0. Colette and Herma Briffault, trans. (2000). The Pure and the Impure. New York: New York Review of Books. ISBN 0-940322-48-X. Conley, John J. (2002). The Suspicion of Virtue: Women Philosophers in Neoclassical France.. Ithaca: Cornell University Press. ISBN 0-8014-4020-3. Conover, Anne (2001). Olga Rudge and Ezra Pound: "What Thou Lovest Well...". New Haven & London: Yale University Press. ISBN 0-300-08703-9. Delarue-Mardrus, Lucie and trans. Anna Livia (1995). The Angel and the Perverts. New York: New York University Press. ISBN 0-8147-5098-2. Faderman, Lillian (1981). Surpassing the Love of Men. New York: William Morrow & Co.. ISBN 0-688-00396-6. Flanner, Janet (1979). Paris was Yesterday: 1925–1939. New York: Penguin. ISBN 0-14-005068-X. Hall, Radclyffe (1981). The Well of Loneliness. New York: Avon. ISBN 0-380-54247-1. Kling, Jean L. (1994). Alice Pike Barney: Her Life and Art. Washington, DC: Smithsonian Institution Press, 24. ISBN 1-56098-344-2. Lockard, Ray Anne (2002). Brooks, Romaine. glbtq: An Encyclopedia of Gay, Lesbian, Bisexual, Transgender, and Queer Culture. Schenkar, Joan (2000). Truly Wilde: The Unsettling Story of Dolly Wilde, Oscar's Unusual Niece. New York: Basic Books. ISBN 0-465-08772-8. Secrest, Meryle (1974). Between Me and Life: A Biography of Romaine Brooks. Garden City, NY: Doubleday, 275. ISBN 0-385-03469-5. Souhami, Diana (1999). The Trials of Radclyffe Hall. New York: Doubleday. ISBN 0-385-48941-2. Weiss, Andrea (1995). Paris Was a Woman: Portraits From the Left Bank. San Francisco: Harper San Francisco. ISBN 0-06-251313-3. ↑ 23.0 23.1 Jay, 11–15. ↑ Barney, Souvenirs Indiscrets, quoted in Souhami (2005), 52. ↑ Wickes (120), Rodriguez (190), and Jay (26). ↑ Schenkar, 156, and Rodriguez, 298. ↑ Souhami (2005), 137–139, 146, and Secrest, 277. ↑ Livia (1992), 191. Rodriguez, 315, calls this a plausible theory. Jay, Karla. 1988. The Amazon and the Page. Bloomington: Indiana University Press. ISBN 0-253-20476-3. Rodriguez, Suzanne. 2002. Wild Heart: A Life: Natalie Clifford Barney and the Decadence of Literary Paris. New York: HarperCollins. ISBN 0-06-093780-7. Souhami, Diana. 2005. Wild Girls: Paris, Sappho, and Art: The Lives and Loves of Natalie Barney and Romaine Brooks. New York: St. Martin's Press. ISBN 0-312-34324-8. Wickes, George. 1976. The Amazon of Letters. New York: Putnam. ISBN 0-399-11864-0. History of "Natalie Clifford Barney"